Hope everyone is having a HOLLY JOLLY Christmas! !Are you in need of some last minute holiday mojo?? 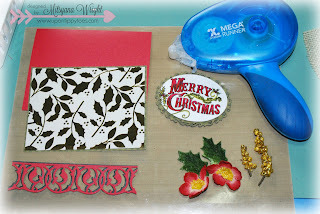 Well, I have a little Christmas inspiration for ya!! 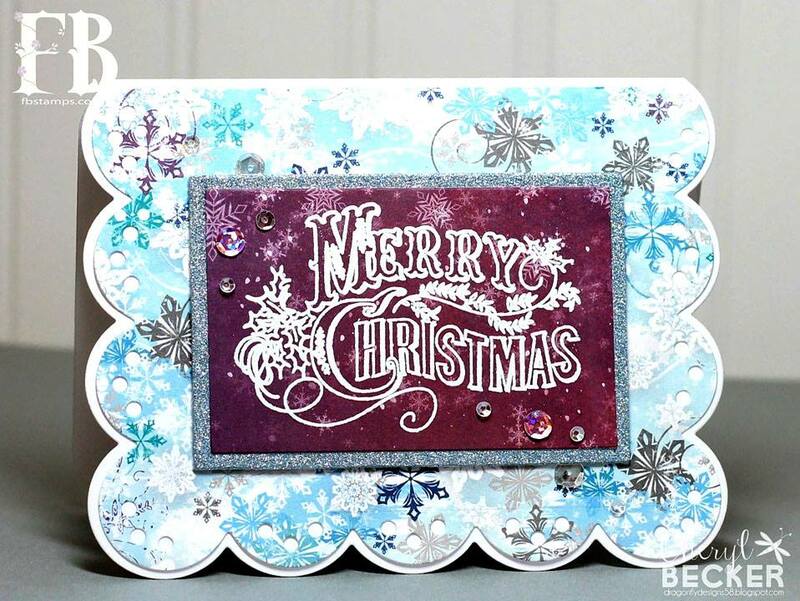 I made this card using FB Stamps' Let it Snow stamps set!! 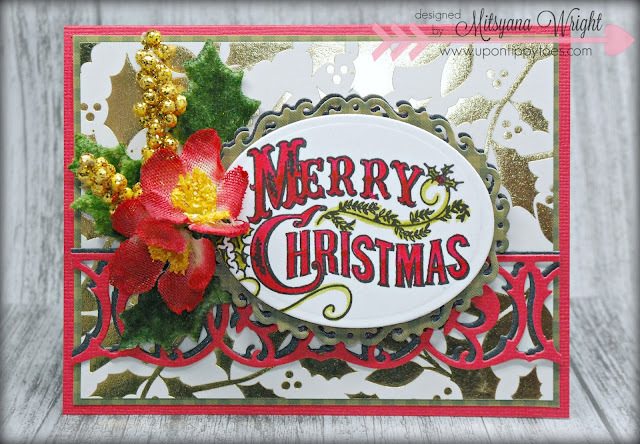 I love how elegant the Merry Christmas sentiment is in this set!! I love it so much I made it the focal point for my card!! I stamped this image with an VersaFine Onyx Black ink and colored in the image with my Zig Kuretake Clean Color Real Brush Markers. 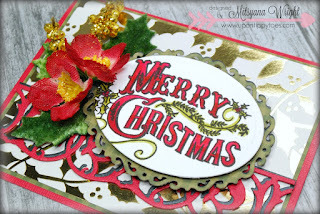 Then die cut the image with an oval die and layered it onto ornate oval die to frame it. Adhered my card layers together using my Xyron Mega Runner. The scroll borders were aso die cuts. I cut out 2 pieces then I attached them together using a glue pen. Then, I attached the joined piece onto the card with clear liquid adhesive. I added Petaloo flowers & holly leaves. I also added berries I purchased from Dollar Tree. I used a thick clear adhesive to attach the bigger embellishments to the card. You could also use hot glue for this. 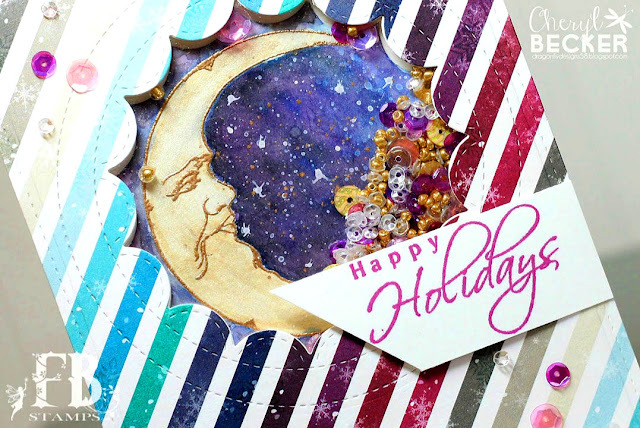 Hope you all enjoyed today's holiday inspiration!! For a complete list of supplies... visit my personal blog here. Trying to get back into doing some crafting. It's been awhile as I'm now back to caring for a new grand baby! She's a honey but I deff don't get as much play time in. 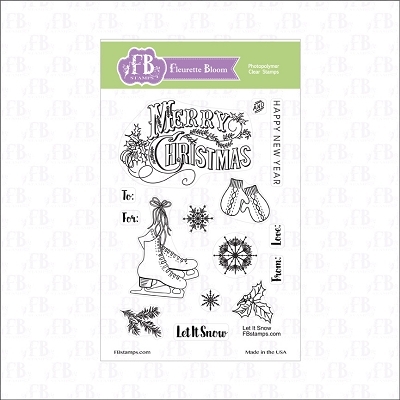 FBStamps latest release has some super cute stamp sets! And this stamp is one of my favorites!!! 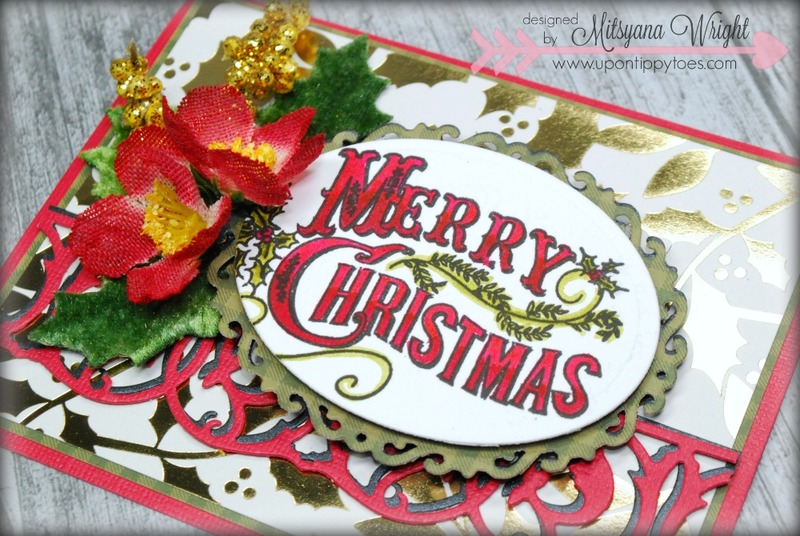 I chose some patterned paper from my stash and did simple white heat embossing of the sentiment. It is so pretty and so ornate! Fleurette did an amazing job drawing this one out! Very pretty as is, but you could certainly do it on regular cardstock and do some coloring. Even watercolor would be nice. It's a bit hard to see, but I added some crystal clear sequins. They kind of pick up the color they are adhered to. This paper is several years old and it's still available. It's probably one of my all time favorites. I prefer non traditional colors for Christmas and this is on the rustic side. So pretty! This image in no way does it justice! You really need to see it in real life. Ok, that's it. I'll provide links for products used. Check it out! Get out what crafting supplies you have and make some pretties! 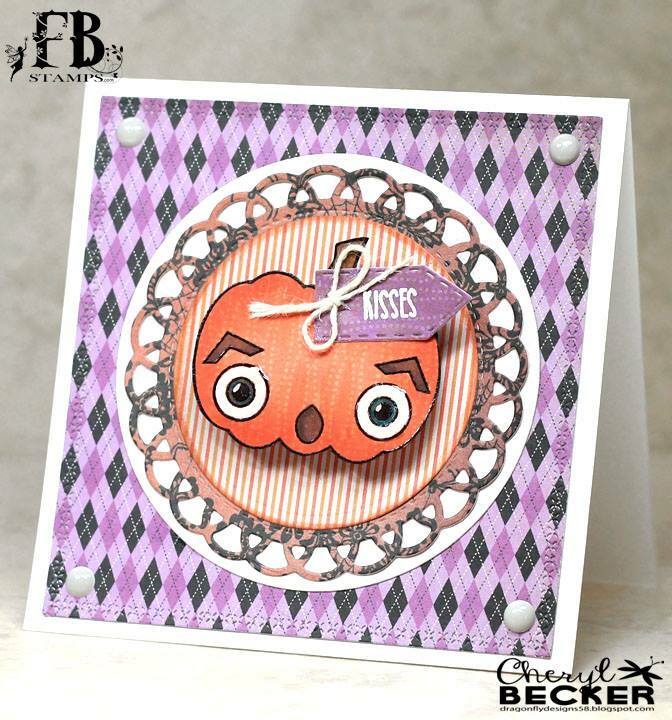 Hi Cheryl here on the blog today, playing around with the new release from FBstamps. Some super cute images in this release and you'll deff want to check them out! 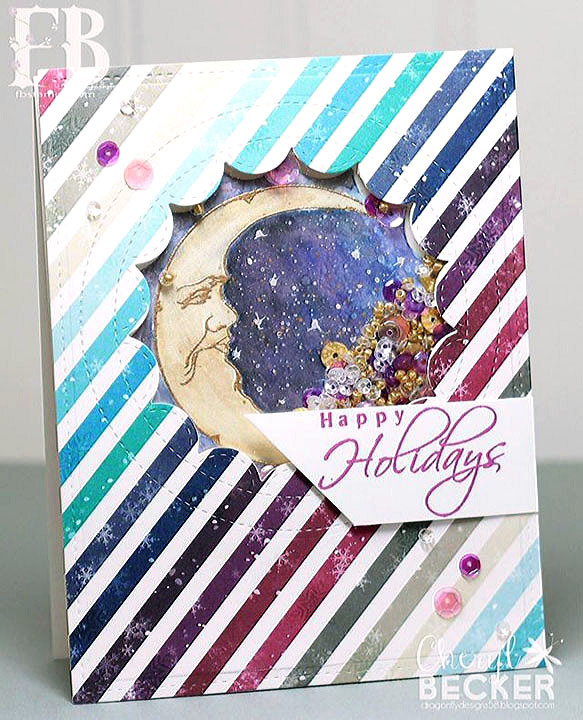 Here's a shaker card I made using the new moon image. I had wanted to try the night sky background for a long time now. Just never did it. Well, I did for this one, and I must say, it was fun and quite easy. Can't really go wrong. Next time I'll not be as afraid of adding black. This could have gone a bit darker. But I'm happy with my first attempt. I splattered white paint over all to create a starry sky. I die cut the window opening and attached acetate on the back side and used foam tape to add the dimension needed. I chose a mixture of sequins and seed beads for the shaker bits and then attached the back panel on top. I stamped my sentiment and added a few sequins for some sparkle. Ilda here today, sharing a fun winter card I made using one of Fleurette Bloom's latest Stamp Set Let It Snow. Happy Thursday, Crafty Friends... It's fall and can you believe Thanksgiving is just in one week?! Thanksgiving is the time of year to be thankful for all they have. For me, I am very thankful for family and friends! I appreciate each and everyone one of them. And though I try to show them I care everyday, sometimes life just get's in the way. I guess that's what I get for "adulting"... mommy & wifey duties, house chores, design team obligations... they all pile up! I'm making an active effort to let my loved ones know I appreciate & love them. 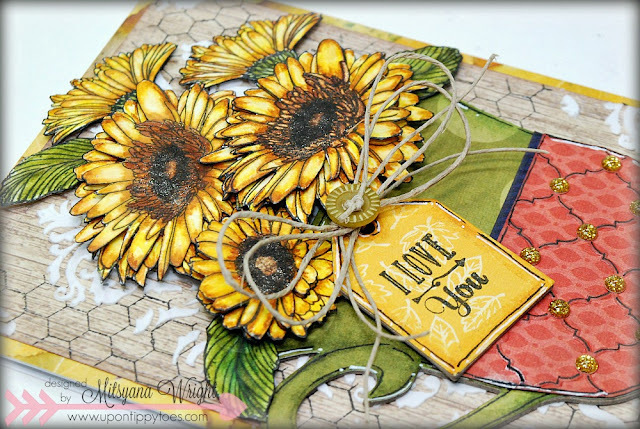 Today is my first Guest DT post for FB stamps and I made this fall themed I love you card. I started by stamping my images in black ink onto mixed media paper. then, I colored the flowers with my Zig Markers in Yellow, Mustard, Beige,Dark Oatmeal, & Brown and went over the centers with a clear glitter pen. I also colored the leaves in Mild Green, Olive green, & Deep Green. 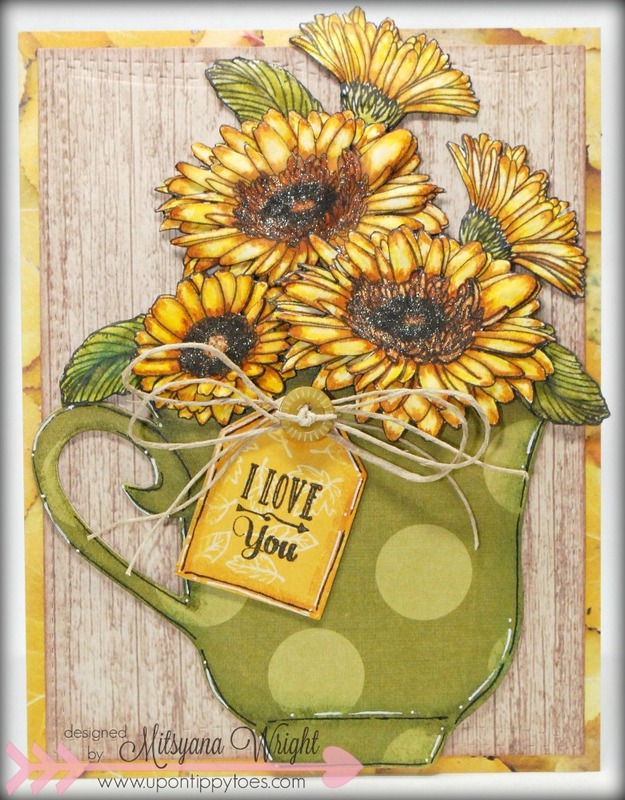 I fussy cut the flowers all the images out but if you are not great at fussy cutting or just want to save time FB Stamps have the cut files for all their stamps and the coordinating digi dies are FREE!! 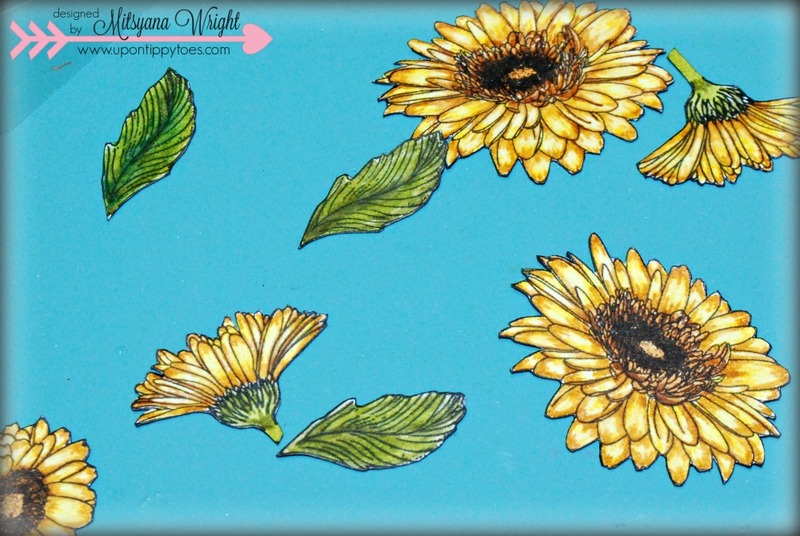 I stamped doubles of the bigger blooms and cut off the outer row of petals. then layered it onto the bigger bloom with foam dots. 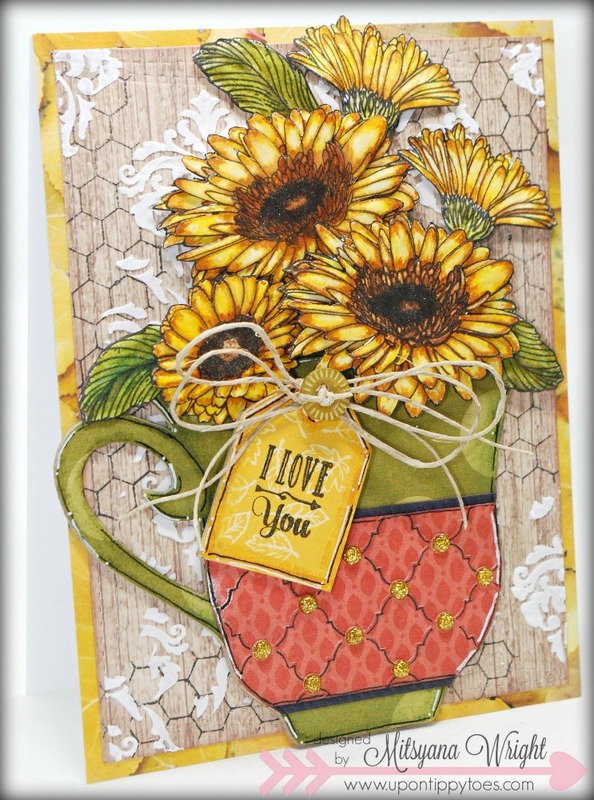 I wanted my flowers to be an arrangement and not just floating on the card... so, I used Eileen Hull's Tea Cup Die for the cup and the tag. I cut them from Chipboard then adhered my patterned paper onto them with my Creative Station Lite. I shaded the edges with abit of chalk in colors that were at least 2 shades darker than the paper. 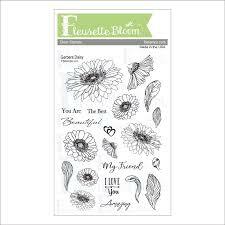 The little "I love You" stamp comes included with the Gerbera Daisies set. So, I added some texture to the background with a bit of modeling paste and a stencil. And cut out a band for my teacup and embossed it and added enamel glitter dots. I traced around the cup and tags with an extra fine black pen and then added highlights with a white gel pen. I also went over the embossed area with the same black pan as well. Then finally, I finished it off with a button topped multi-looped twine bow. 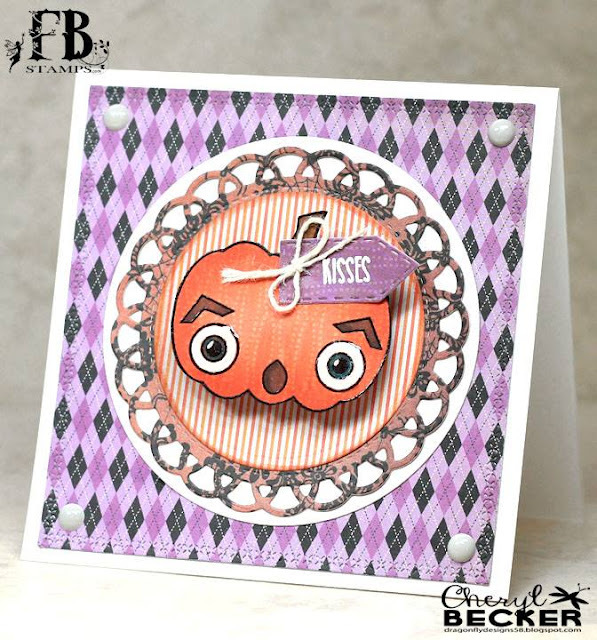 I am enjoying this stamp set very much and I'm looking forward to making more with it!! I hope you all enjoyed today's card!! 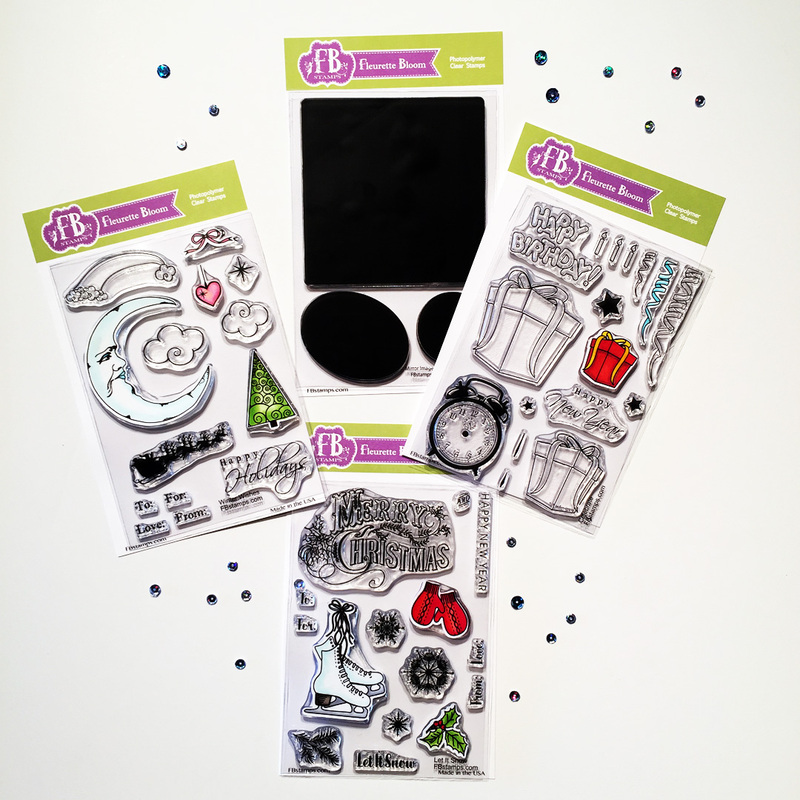 This bundle is full of fantastic stamps, including our new Mirror Image stamp set, that will literally double your stamping collection! Hello my crafty Friends, Ilda here again! 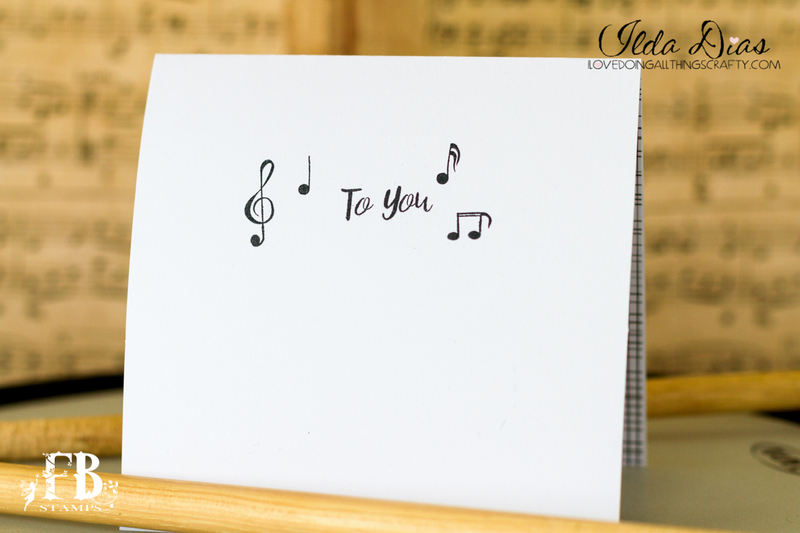 The stamps I used for this card come from Fleurette Bloom's Beautiful Music Stamp Set. 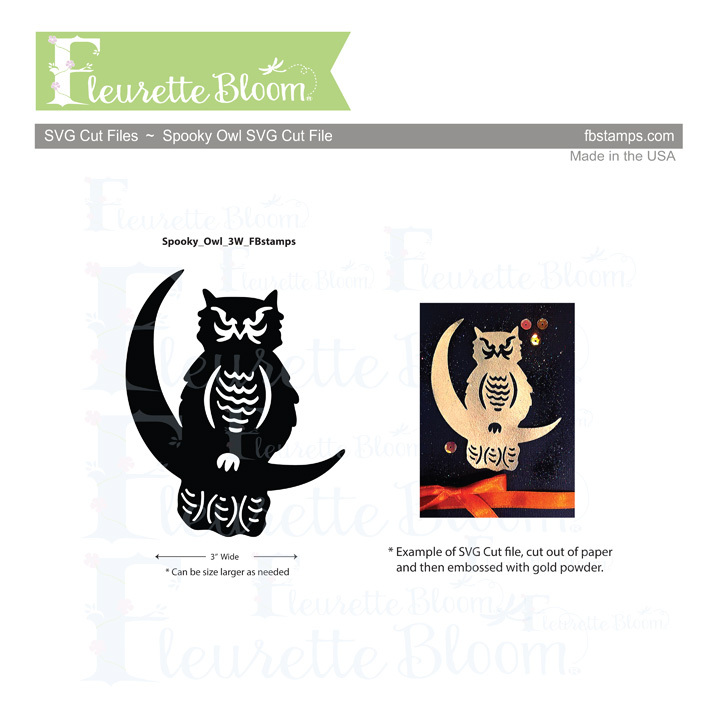 Make sure you stop by her shop as she still has her Fall Bundle Special Deal going on while supplies last! 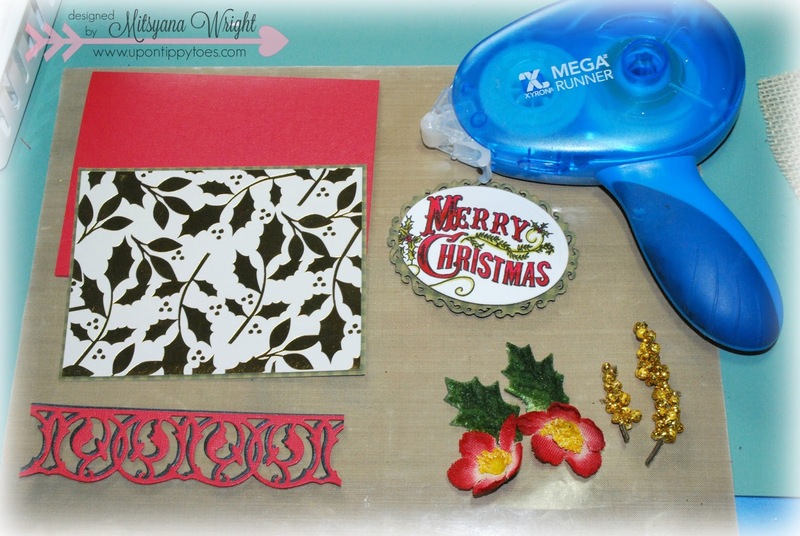 For the complete supply list stop by MY BLOG where I will link a list of the supplies I used. I also have a special treat for my visual learners. Or watch it on YouTube here <----click! Hope you enjoyed and were inspired by this Birthday Musical Card. 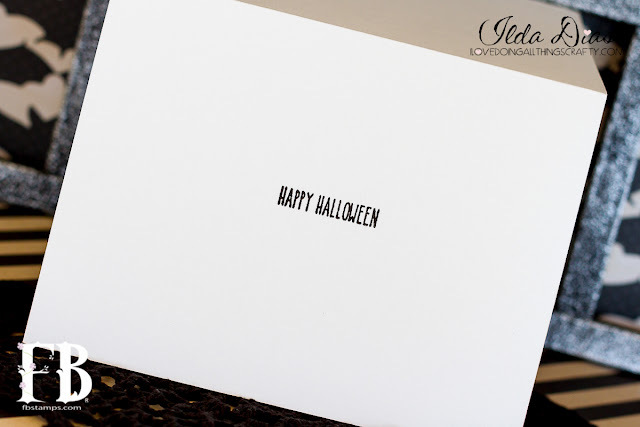 Ilda here taking over Fleurette's Blog... Muhaha! 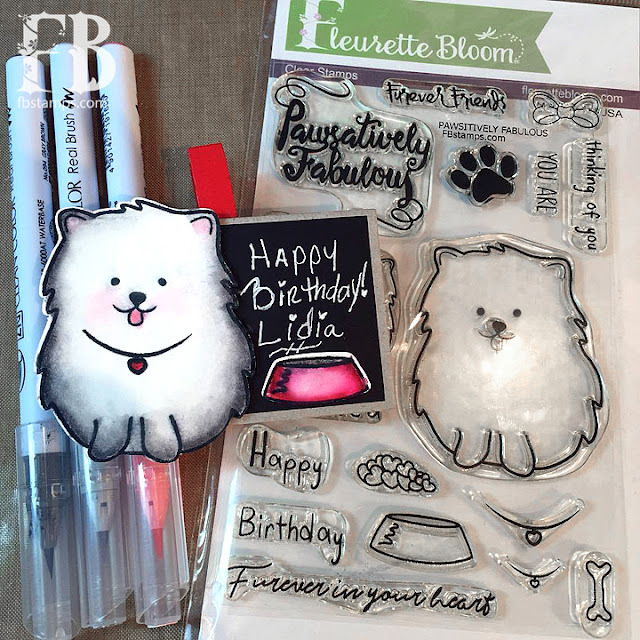 I finally got a chance to play with some stamps from Fleurette latest stamp Release. 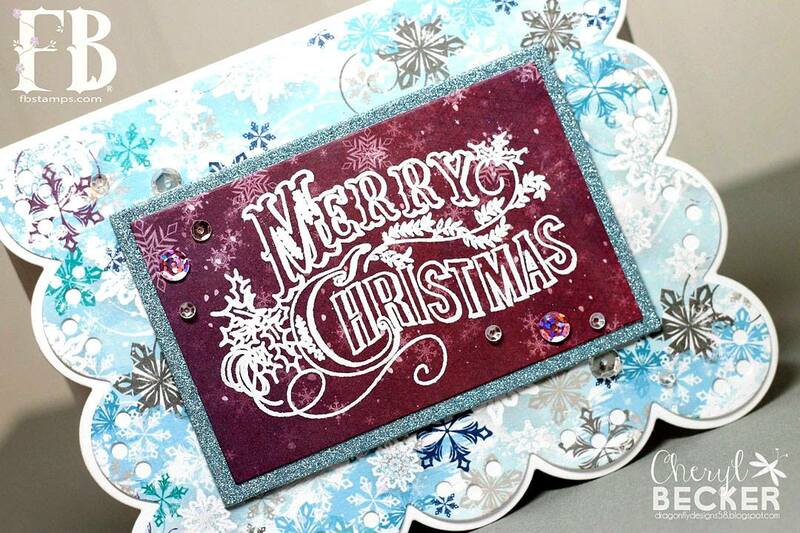 So on to my project for today... this is a pretty simple basic shaker card using vellum and bat sequins. 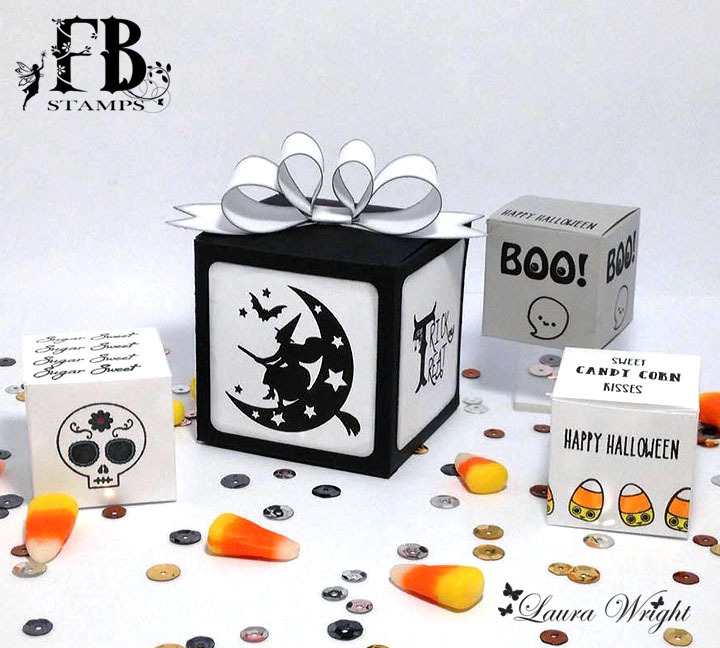 The Stamps I used come from the Pumpkin Friends and the Go Batty Stamp Set. Ok....so, I think this is the cutest pumpkin ever!!! I decided to pull out some cute patterned papers I had for fall time and I stamped the pumpkin on one of the orange papers. Then I grabbed a few Copic markers and added some shading. I used white gel pen on the eyes and then a coating of Glossy Accents. I pulled out some circle dies and made a layering to use on the center of the card. I used some foam tape for added dimension. I also cut a little tag and stamped and white heat embossed the sentiment. I tied a bit of twine and glued it on the stem. The patterned paper for the background was also cut using a square die. It is cut to 4x4 and adhered to a 4 1/4 x 4 1/4 size card base. I found some enamel dots in a real soft gray that looked good with the patterned paper, so I put one in each corner. 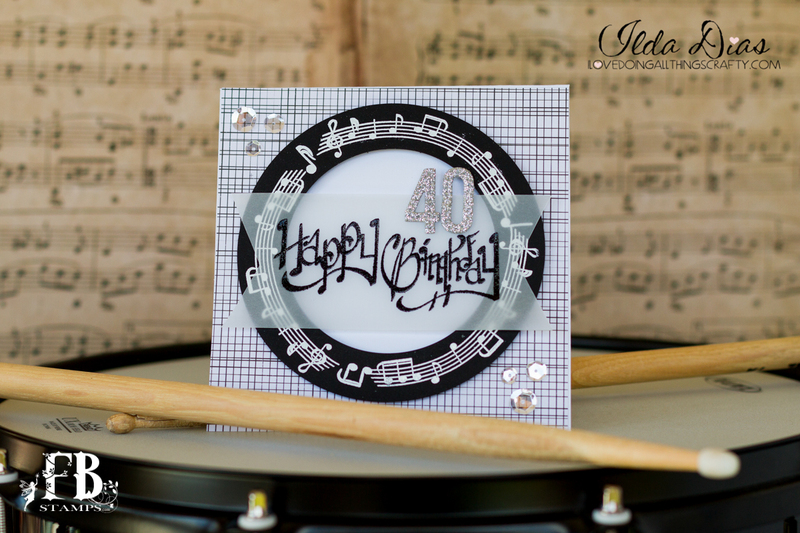 I don't often make this size card and don't know why....cause I like it for something different and it will still go in a standard A2 envelope. Anyway, so there you have it. 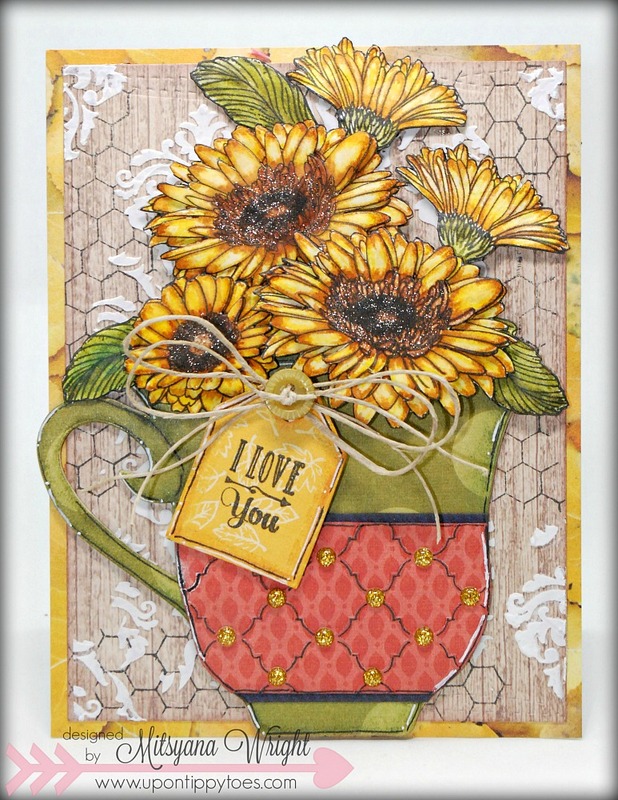 A super cute fall card that uses all patterned papers. Quick and easy yet super cute! Get your craft and have fun with some new products! How adorable are these Halloween Treat Boxes that DT Member Laura Wright created using our "Holly Days" Boxes & Cards SVG Kit :) She incorporated our newly released stamps to turn them into the perfect Halloween treat boxes. Just imagine how much someone would enjoy receiving one of these that you made! Oh what fun fall brings! 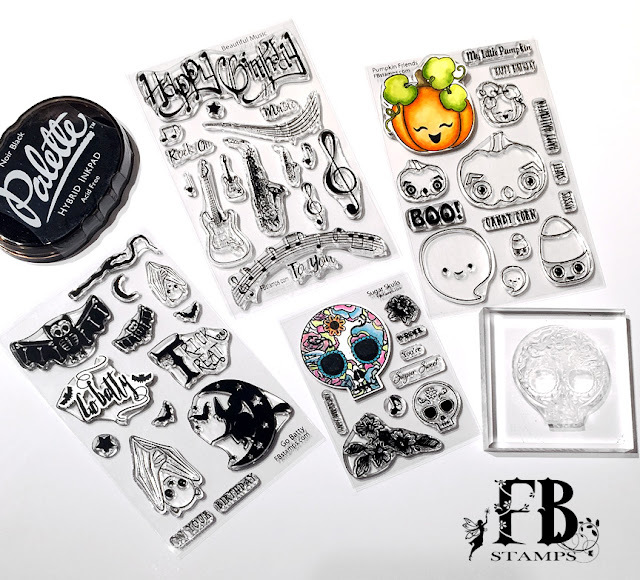 The New Stamp Sets are here :) Hurry in and grab your Fall Bundle Pack Special and get a FREE Stamp Set!!! This bundle comes with 3 adorable 4x6 sets and you get the 4th 3x4 Set FREE with the purchase of this bundle special. So many fun possibilities! Be sure to grab your bundle while they last. Yay!!! The time for Sneak Peaks of the new release is here!!! Are you ready for some cute stamp sets by Fleurette Bloom, aka FBStamps?!?!?! I have a card to show you today using one of the new sets. Until Fleurette, I had no idea what a Sugar Skull was, lol! Just hadn't crossed my radar, lol. I do now, and soooo cute! 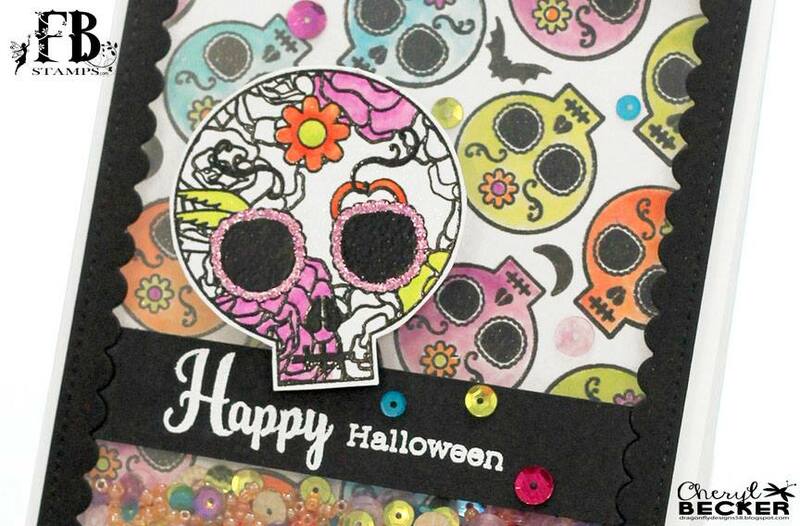 Anyway, I used the Sugar Skulls Stamp Set for this card. First thing I did was create a grid on my background using a T-square ruler and stamped the smaller Sugar Skull on a diagonal line to create a fun pattern. Then I grabbed some fun colors in my Distress Markers and watercolored in the skulls. I cut a frame in black using a Pretty Pink Posh die and glued acetate to the back. I then used two layers of foam tape to have room for the sequins to shake. I chose sequin colors like the background and put them into the frame piece. Then I put the background piece on top. And shake, shake, shake! I love shakers!!! 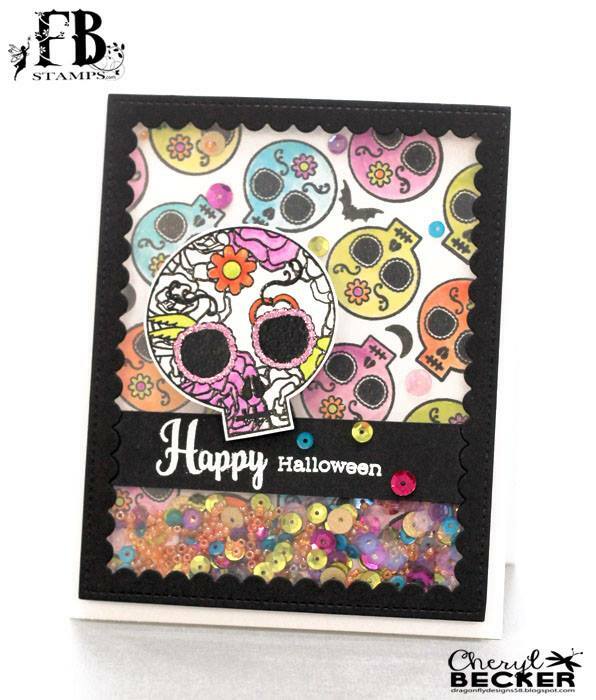 I took the larger Sugar Skull and used black embossing powder. Then I chose just a few spots to add some pops of color....same as in the background. I used some Stickles to make the frames around the glasses nice and sparkly. Then I embossed the sentiment on a strip of black and cut using the same frame die so it would nestle right into the scallops. Nice and tidy! Lol. I added some foam dimensionals to the back of the Sugar Skull and adhered it right above the strip. Added a few more sequins and then put that piece onto the front of an A2 sized card. Keep watching! There will be new Sneak Peaks every day. 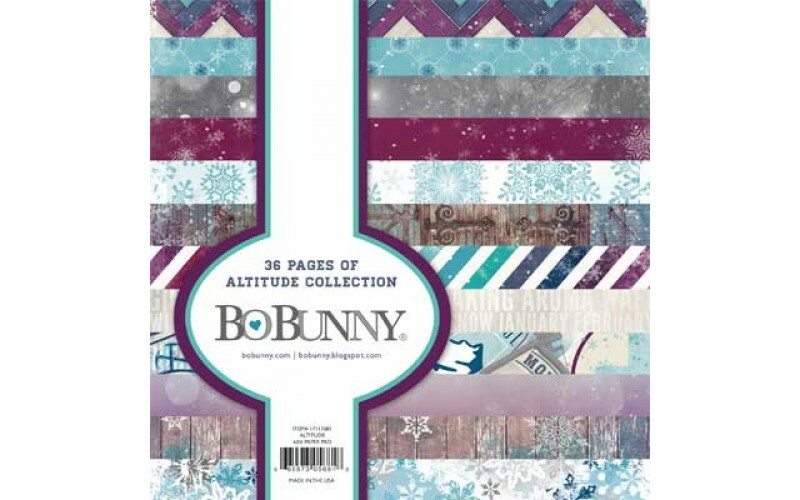 Lots of cute new stamp sets and you won't wanna miss any of them. Here's where you can shop for all the new goodies. Hope you have fun watching the new stuff being shown, and hope you find a bit of inspiration as well! Hey y'all Laura here! 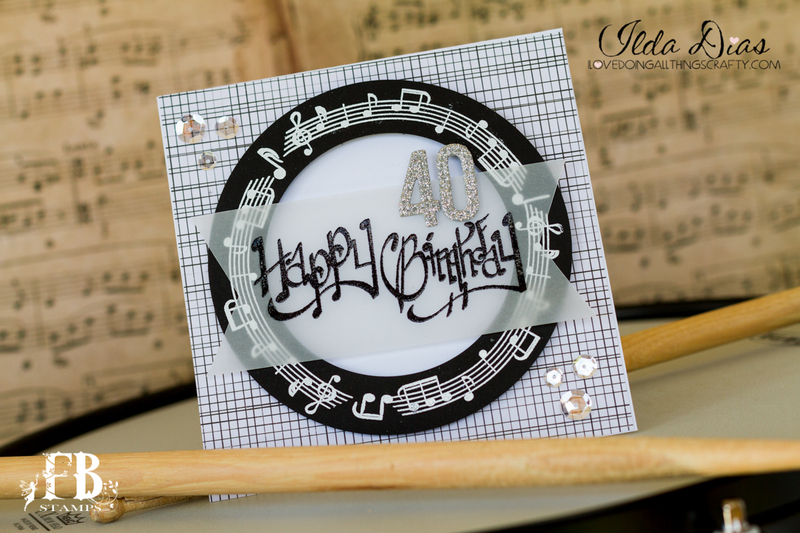 Today I made this cute birthday card using a few different stamp sets. 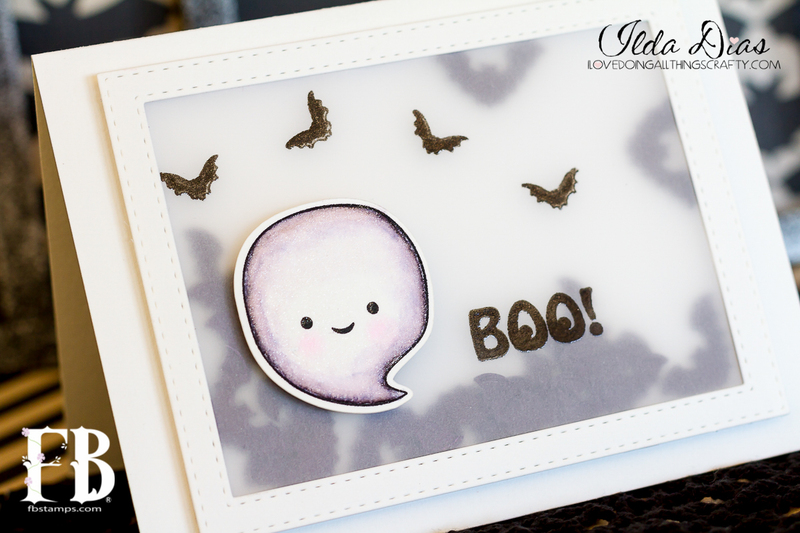 This card is super easy to make! 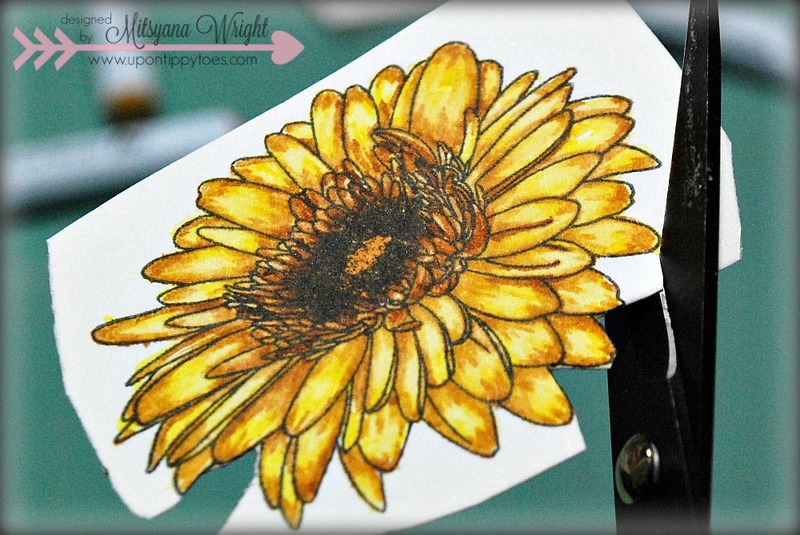 Start with stamping your motorcycle in black ink on your hot pink paper, then mask it off and stamp over it with the largest flower from the Gerbera Daisy set in Grey Flannel ink. While you have it covered with the masking go ahead and stamp the flowers in each corner. Take your masking off and stamp Happy Birthday Beautiful in black ink. 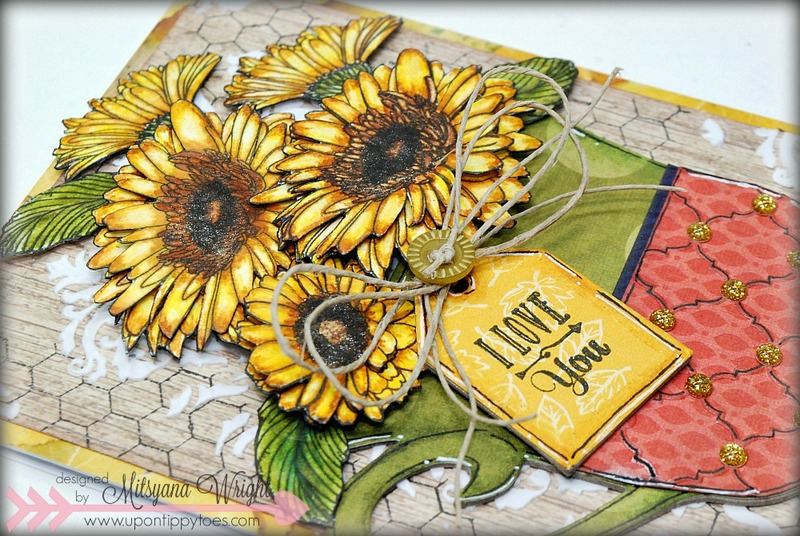 Happy Birthday is from the Happy Days stamp set and Beautiful is from the Gerbera Daisy stamp set. 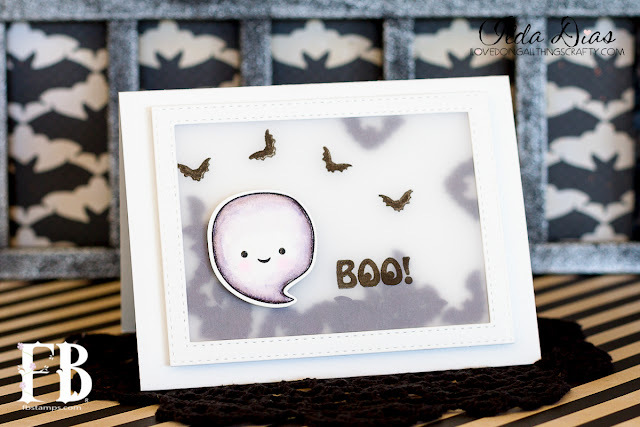 Ink the edges of your pink and grey card stock with Tim Holtz black distress ink. 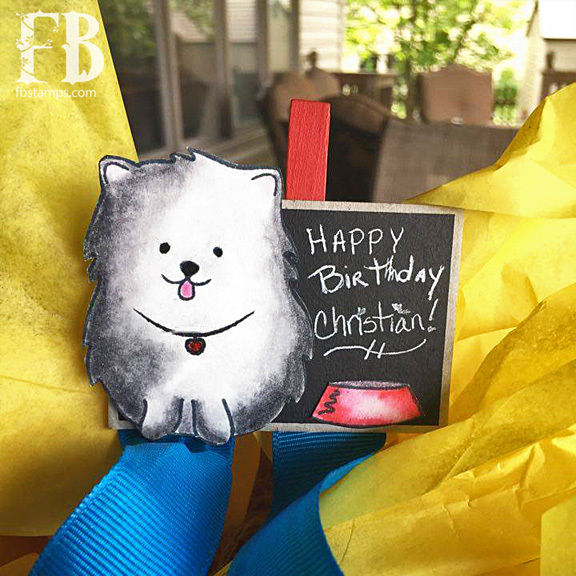 Now glue your hot pink card stock to your grey card stock and tie the black ribbon around the bottom in a bow. Glue this to your black card base and glue a few pink sequins on for a little sparkle. For the inside of the card you'll need a hot pink piece of card stock 3 1/2 * 4 7/8 ink the edges with black distress ink and stamp I Love You in the bottom corner. I Love you is from the Gerbera Daisy stamp set. 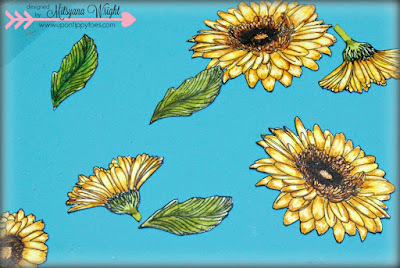 Be sure to head on over to www.fleurettebloom.com for these great stamps and sequins! Hope you enjoy this card! Happy crafting! Simply cut him out on your digital cutting machine and add him to whatever you like! In the example above, I cut him out of paper then embossed him with gold embossing powder.